Near-field communication (NFC) is a technology that allows devices to communicate through radio communication when they’re near each other. UK inventor John McLear created an NFC ring that can be used to transfer information, unlock doors or cell phones, and connect people. 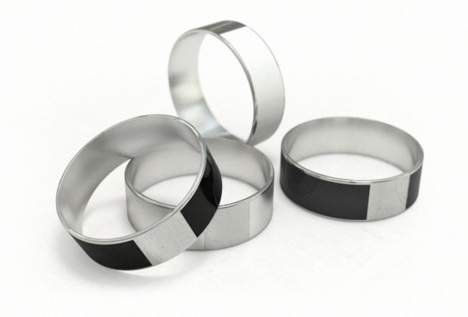 The NFC Ring looks like a regular silver ring, but it contains two NFC inlays: one for personal information and one for public. The applications for the ring are nearly endless. It will allow you to lock and unlock your front door without a key, as demonstrated in the above video. The ring will also be useful for unlocking your phone and sharing your contact information. Each inlay has a 144 byte capacity, which isn’t much but is enough to store some personal data to share. It’s also enough to share info like personal websites, kind of like a digital calling card. Like so many other great tech projects, this one is seeking funding on Kickstarter. A pledge of £22 (around $33 USD) gets you an NFC ring and the associated app. See more in Cybernetics or under Technology. July, 2013.